Classic Venetian Glass Bead in a 10mm round to match all our other white gold foil beads. The size of this Murano glass bead make it useful for Venetian Bracelets, Venetian Glass Earrings and as spacer beads in many other of your Murano Glass Jewelry designs. 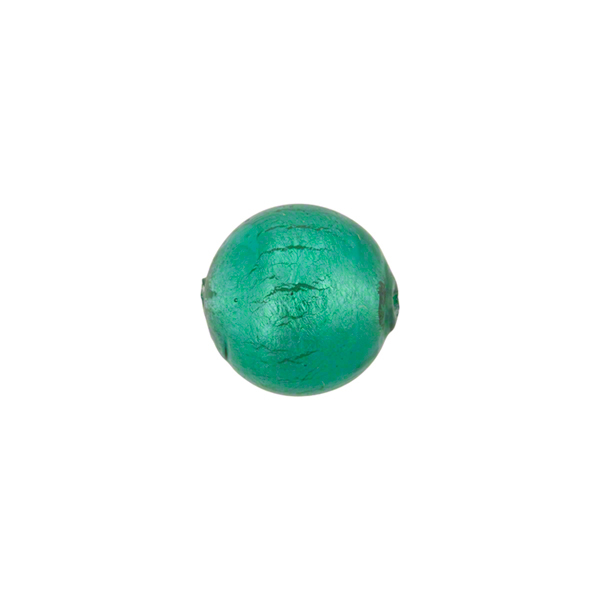 This bead is handmade using the famous Murano Glass. The color is light Verde Marino, a greenish Aqua Murano glass over white gold foil. Q: The description does not include information of a hole in the center. Do all of your beads have holes? A: The hole is a nominal 1mm. It is the same for almost all our beads unless otherwise noted in the title, part number or description. This is because we normally use a 1mm copper mandrel.